AKON’s Hybrid lab is equipped with the best circuit printing as well as firing machines available to produce highly reliable thick -film circuits. A semi-automatic printing machine with an optical aligner is used to print Mil Grade substrates for repeatable performance as well as reliable modules where the customer demands good thermal conductivity. AKON’s State of the Art Assembly Department consists of automated and semi-automated equipment to perform die-attach (eutectic and epoxy methods), bonding, and gap welding. Upon completion of each operation, in process QA is performed to determine adherence to workmanship standards, with the goal of identifying any potential failure mechanisms. In the production environment, all work-in-process modules are stored in nitrogen-filled desiccators to minimize oxidation and related storage issues. Our assemblers are experienced and trained in assembly techniques in accordance with MIL-STD-2000, MIL-S-19500, MIL-M-38510, and MIL-883E. AKON’s Test and Tune Department is staffed with highly trained and experienced technicians and equipped with the latest in test-equipment, to perform critical alignment, testing and tuning of components and subsystems. 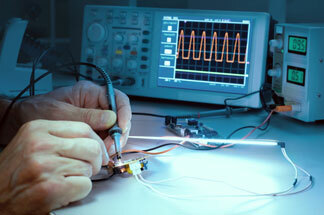 Automated test-stations are utilized, as well as bench test set-ups. AKON at present maintains 35 test-stations operational to 20 GHz and 4 test-stations capable of 40 GHz. 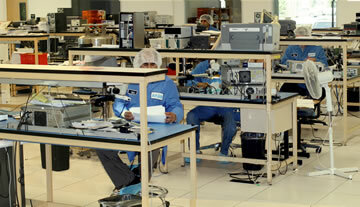 In the test-phase, all products and activities are overseen and monitored by senior staff or engineering personnel. Demanding testing is performed as required for the specific component or subassembly, including full temperature testing. AKON has recently added a paint department to its facility, in an effort to continue its drive towards vertical integration and process and cost controls. We use Mil-preference primer (per MIL-PRF-23377J) and paint (per MIL-PRF-85285D), for adhesion, and resistance to heat, abrasion, chemicals and oil, and durability. AKON also maintains an in-house Mil-grade silk-screening capability. A MIL-grade, 2-part epoxy ink identified and procured via an AKON SCD, is used. The ink is tested for adhesion and wearability. The latest software gives us the ability to design the layout and stencils. 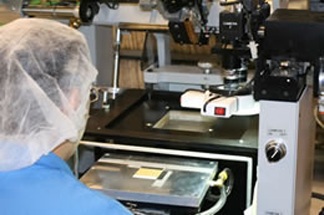 AKON also has thermal printing capability for high-adhesion Mylar labels per customer request.